This article is dependent on functionality that is not available until v4.5.x is released. Information relating to the current build status is available on the DAZ Studio v4.x page. This article teaches you how to create a Head Split Morph to apply/remove the Goblin characters head. It is a continuation of Advanced: Creating Morph Controlled Morphs (WIP), and assumes you have completed or are familiar with the information it contains. This tutorial is for those who understand the basics and intermediate steps for character creation and 3rd party modeling tools. The items discussed require an advanced level of understanding DAZ Studio 4 Pro. The first step is to prepare the character for export. Make sure the Genesis figure is in the zero position. Apply the new character morph “Goblin”. With Genesis selected in the scene tab, select the Parameters Pane. Open up the General tab, select Mesh Resolution. Set the Resolution Level to Base. Set the subdivision level to 0. In the modeler, the neck is used as a blend or transition area between the head and the body. Due to the wide variety of modeling apps that are out there, this task will be accomplished differently, depending on what type of modeling tools are available to the artist, so this will not be covered in this tutorial. Save the morph with the prefix FHMdrGoblin (FHM = Full Head Morph, drGoblin = character name). Once the head morph is complete, load it into DAZ studio using Morph Loader Pro.... (See Illus. 3) The default settings will work, so no need to change anything. By default the morph will load under Morphs/MorphLoader. As a test, adjust the new Goblin head to Negative 100%. It should remove the Goblin character head and leave just the Goblin Body with the Genesis base head. In this state, other available head morphs can be applied onto the Goblin's body. (See Illus. 4) This makes the character more versatile for the end user. A user could also apply the new Goblin head morph onto a different characters body. There is another step that needs to be done to get the Goblin Head finalized. The MCM's for the eyes need to be created for the Goblin Head. There are a few different ways to do this. In the previous Advanced: Creating Morph Controlled Morphs (WIP), there were two eyeblink morph correctives that were created for the Goblin Full Body Morph. These then were taken into DAZ Studio using Morph Loader Pro, and Reverse Deformations was used to reverse everything out of the morph, leaving just the eye fix in the morph only. Instead of sculpting two new eyeblink correctives for the head, it is possible to use the corrective morphs that are already loaded to create two new correctives for the Goblin Head morph. This now applies the corrective to the Goblin Head. This is exported out and named MCMdrFHMGoblinEyeClosedL. 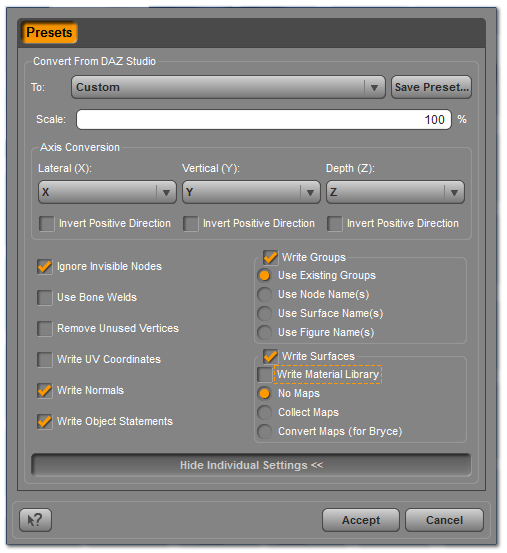 (Remember to Set the Resolution of Genesis to Base, and the subdivision level to 1 before export). Save it in a safe place, set the control back to 0, and click back on the chain, relinking the ERC. Repeat this for the R Eye Corrective. The new MCM's are loaded into DAZ Studio with Morph Loader Pro, however in this case there is no need to apply the eyes Closed Morphs, because that was already done for the original set. All that needs to be applied is the GoblinHead morph. When these are imported in with Morph Loader Pro, and reverse deformations are changed to yes, they should work fine. Once they are loaded, the instructions are basically the same for linking the ERC to get them to work. The first thing to do is to think about what this new MCM needs to do. It must only operate when the new Character GoblinHead is applied. (It should not apply when Genesis or a different character morph is added, unless the GoblinHead control is mixed in). It must only operate when the Eyes Closed Right is applied. (Keep in mind that the Eyes Closed Right is controlled by the Eyes Closed control. Anything that gets linked to Eyes Closed Right will be controlled by the Eyes Closed control, which works to your advantage in this case). Now that it is determined what the control must do, open up Property Editor. (See Illus. 8) Notice that Property Editor is divided into 2 sections. The Left contains Grouping/Settings, and the Right side contains the Hierarchy. On the Left side, locate the new MCM that was created for the character. It should be found under the Morphs, Morph Loader section. If it is not there, click on tab options and use the Refresh Pane option to bring it up. This will take care of criteria 1. The morph must only apply when the GoblinHead morph is turned on. The multiply option will not scroll on the GoblinHead morph, but now the link will only work when the GoblinHead morph is applied. Close Property Editor and test the morph. Zero the figure. Apply the new character morph GoblinHead, and apply the Eyes Closed Right morph. The new MCM should be at its full strength. Leave the Eyes Closed Right morph on, and remove the new character GoblinHead morph. The new MCM should scale back down to 0. The same steps are repeated for the Left Eye corrective morph. At this point, any work you have done will be lost if you close DAZ Studio or start a new scene. You must save your Head Split Morph. If you need to learn how to save morphs, please refer to the Saving Morphs (WIP) 2014 article. Here you will learn the different saving options available and select the one that best fits your workflow. This completes the third tutorial in our series. When you are ready, continue on to the rest of the Advanced Character Creation series, linked below.